Atlas Classique Ancienne et Moderne de Eugene Belin. 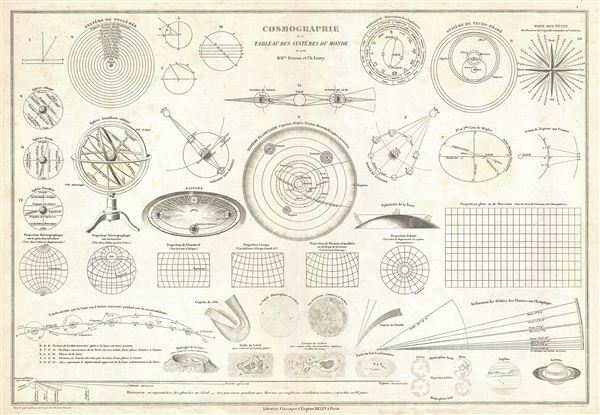 A fine c. 1914 cosmographic chart by Abbe Drioux and Charles Leroy. This chart offers a wealth of information on the solar system, planetary alignment, the seasons, celestial projections, lunar features, and orbital paths. Published as part of eugene's Belin's Atlas Universel et Classique. This atlas went through many editions from 1868 to 1920 and it is all but impossible to identify the specific year of this chart without having the full atlas in hand. Abbé Claude-Joseph Drioux (1820-1898) was a French priest, popular educator, cartographer, geographer, historian, and religious writer. Drioux was born 17 February 1820 at Bourdons, Haute-Marne. Drioux trained as a Priest before becoming a professor at the seminary of Langres. Drioux was the "star author" of the publishers Eugene Belin. The 51 school textbooks of the Abbé Drioux were enormously popular throughout France and went through some thirty editions with over 20 million volumes sold. According to the Dictionnaire de Biographie Française, "they almost had a monopoly on the education of children of both sexes in the free institutions both primary and secondary." Drioux built his success on distilling contemporary German scientific and academic discoveries, the most advanced in the world at the time, for the French audience. As a geographer Drioux worked primarily with cartographer Charles Leroy. Drioux publishing success allowed him to purchase the magnificent Chateau de Lanty Nièvre, Bourgogne, France, former property of the Marquise de Coligny, where he died 13 May 1898. Charles Leroy (fl. c. 1835 - c. 1890) was a French cartographer active in the middle to late 18th century. Leroy published a number of maps in conjunction with the educational author Abbe Drioux and his publisher Eugene Belin of Belin Freres. Little else is known of Leroy. Belin (fl. 1777 - present) is a French publishing concern active in Paris from 1777 to present. The Belin firm was founded by Francois Bellin, who founded the "Librarie Belin" on March 10, 1777. Librarie Belin opened up shop on Paris' Rue Saint-Jacques, where the nearby Sorbonne proved to be his best customer. By the start of the French Revolution Belin was one of the most prominent publishers in Paris with about 412 titles and some 177 publishing partnerships. After his death the Belin publishing library fell into the hands of two competing brothers, Belin-Le Prieur and Belin-Mandar, with the latter being the more prominent. It was Belin-Mandar, under Adele Belin, who, in 1844, made the profitable contract with the educational writer Abbe Drioux - leading to the rise of Belin as one of the most profitable publishing firms in France. Adele Belin died one year later, in 1845 leaving the business to her son Augustus Eugene Belin (1816 - 1868), who renamed the firm Librarie Classique Eugene Belin. Eugene retained the Drioux contract and over the next fifty years cornered the market on French educational atlases and textbooks. Following Eugene's death the firm was managed by his many decedents who published as Belin Freres. Today Belin remains one of the largest publishing concerns in France. Care should be taken not to confuse Belin with Jacques Nicholas Bellin, a French hydrographer of the 18th century. Drioux, A., and Leroy, C., Atlas Universel Et Classique De Geographie Ancienne, Romaine, Du Moyen Age, Moderne et Contemporaine, (Librarie Classique Eugene Belin, Paris), 1914. Very good. Light margin soiling. Original centerfold.